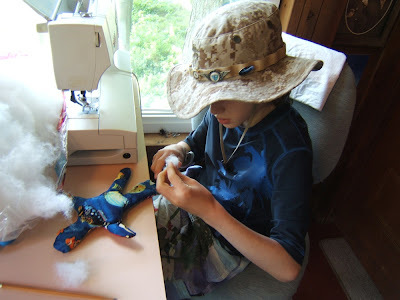 Over the July 4th weekend one of my grandsons announced he had a sewing project. He has designed and sewn enough that he knew what to do when I gave him a sheet of paper. He drew an outline of what he had in mind which became his pattern. I got out the drawer of fabrics put together especially for my grandchildren to create from. 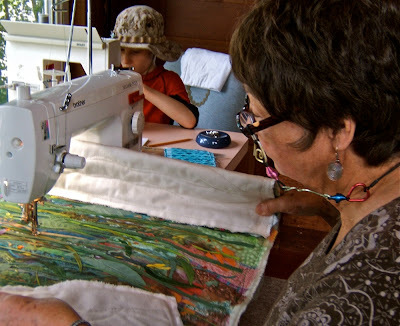 He chose his fabric and got busy cutting and sewing while I continued quilting one of the Prairie Flower panels. 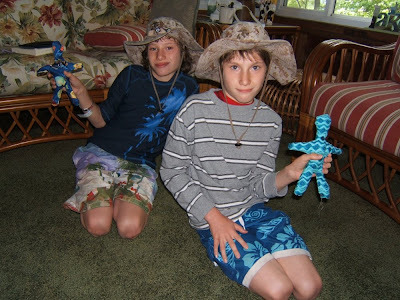 When his brother came up from the beach he too wanted to make a voodoo doll. They play a computer game that involves these plus magical staffs. Earlier that day they had each found bleached sticks on the beach and decorated them with feathers, and braided beach grass. Walla! Here are their completed voodoo dolls. This seems to be a good post to include a photo of one the spirit dolls that is part of our SMQ Thursday Bee round robin. 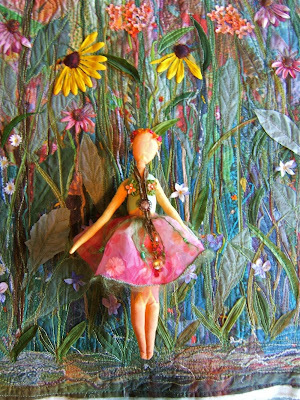 After adding my touches I couldn't resist posing her on a Prairie Flower panel. My contributions are her breasts made from silk leaves (yo yo style) and small silk flowers encased between the two layers of her organza skirt. I couched the bottom edges of those two layers together with an angora yarn then made a belt with angora streamers and beads. Of course, I really had no time to be doing this, but I needed to play! You are one cool Grandma! Lucky the kids that have you for a grandma! How can they not be creative when they are surrounded by what you do? Hey Nellie.... I think you have some future designers in the family..
What a nice way to spend time with the grandchildren.. I love the spirit doll that looks content in a pretty garden of posies! Very nice. And the voo doo dolls must've been fun! Very cool voo doo dolls! Love seeing the close up of the prairie flowers panel. It is looking fantastic! I looooove your prairie flowers panel. It's all in the name, isn't it: voodoo doll is much more interesting to make than a doll :o)) Nice project for your grandsons. What joy it must bring to have your grandsons working on their projects alongside you. The voodoo dolls are great. Your spirit doll looks so lovely against the Prairie Flower panel. Nothing better than seeing a young kid sewing! And the last shot with the prairie sprite is wonderful!